Every time we physically or mentally come across them in our storage areas, a twinge of remorse says, “Ugh. I really need to finish that.” If we would grab it and do that, it would be over. But instead it just sorts of lingers and the mantra repeats –‘I should. I should. I should…”. Sometimes for years. Ask me how I know. They cast a shadow of guilt over new, fresh ideas and projects. The UFO’s take some or all of the pleasure out of current projects because thoughts loop around our brains about how it would really be best if we just finished the old one first. Even buying a new piece of fabric can start the guilt feelings. Ask me how I know. The tendency or habit of not finishing sewing and craft items seems to bleed over into other areas of life, leaving bits and things undone. Ask me how I know. Not finishing a sewing project can happen for lots of reasons. A new skill was required to do a step and it seemed too difficult. Put it away ’til later. You needed a: finding, zipper, something and just never got around to sourcing it. Ont to something else. Halfway through the project you just don’t like the fit, or the way it’s turning out or…you get the idea. I have a few items that fall in this category. Today I’m asking myself why I still have them around. They really are just clutter. Here are mine. A pair of leggings that are huge and need a ton altering. I just cut out too big of a size and after lots of stitching (serging, pressing and coverstitching) I became overwhelmed with trying to fix them and just hung them in the closet. A pair of pants that only needs the waistband attached. A really cute jacket that needs the sleeves hemmed. Why? The hard part is done. Jeez. Okay, enough bad self talk! The point of my story is this: finish them or get rid of them! FO’ REAL! They collect low-level energy and they bring you down. Don’t feel too terrible about throwing them away. If you think about it, they are already in the landfill. They’re not being used and the landfill is your closet. 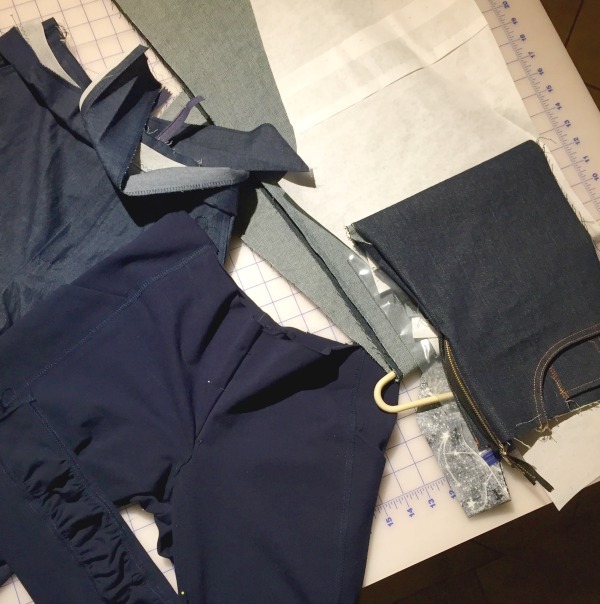 If you want to finish something and need help or just the time set aside, consider an Open Sew and Fit Review session at the Lounge. Here’s our call to action, friends: let’s either finish them or toss them and cut our losses, today.